The Cordless Professional is Waterpik’s latest “update” to their much loved Cordless Plus model. After all, it’s been 10 years and it should be time to retire the aging Cordless Plus, right? Except, the Cordless Professional is not an improvement at all. In fact, it’s essentially the same model. Literally. Other than a new name and coat of paint, the Cordless Professional is identical to the Cordless Plus in functionality and features. The biggest difference is their pricing, with the newly released Cordless Professional being about $15 more expensive. Technically, it does come with a battery powered toothbrush which has a value of $10. However, if we’re just talking about the water flosser here, you’re paying more money for the same product and the toothbrush may not even be something you need. This isn’t to say that the product is bad; we just want to give you a heads up so that you do not pay more for a product that is identical to one that has been out for 10 years already. 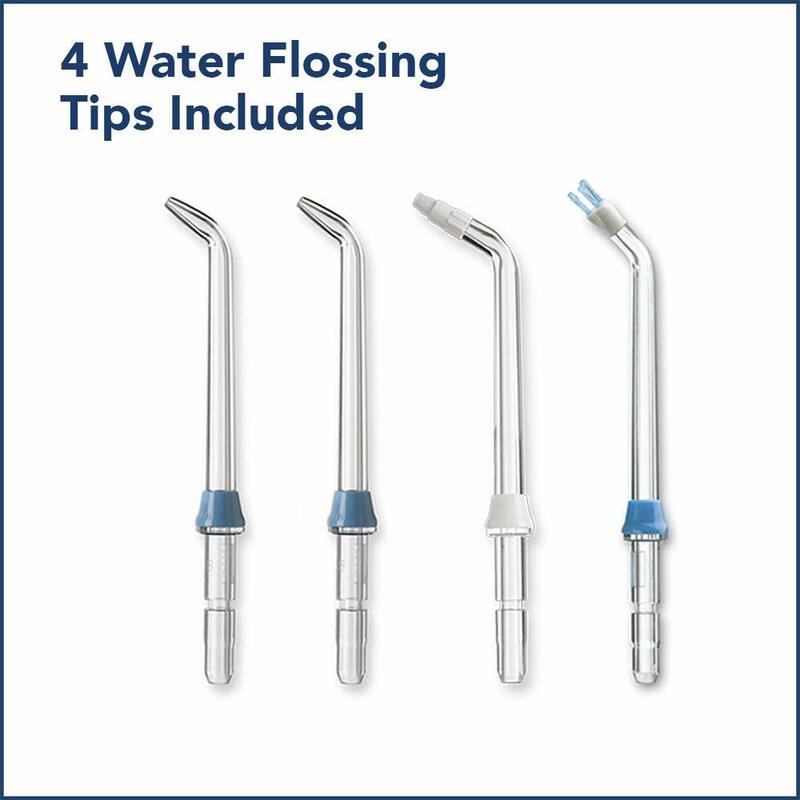 As with all Waterpik flossers, you get multiple flosser tips and an instruction manual that barely has any information. Here’s what you can expect to find on the Cordless Professional. At the front of the unit you will see two switches. The top switch is the power switch. The bottom switch is the water pressure selector. There are only two settings – low (45 PSI) and high (75 PSI). 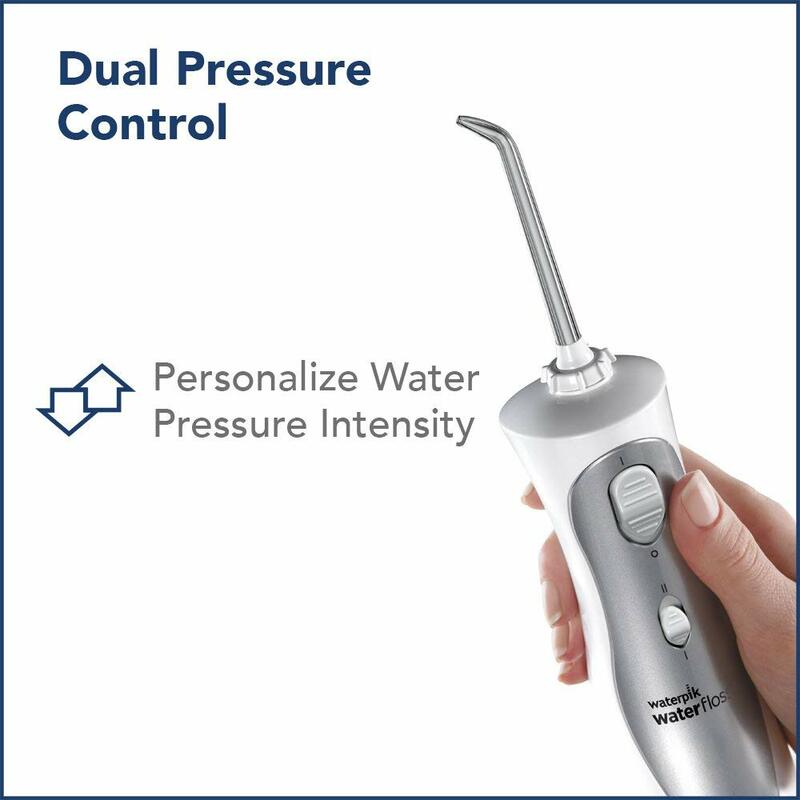 If you’ve used other Waterpik products like the Aquarius Professional or the Ultra that have pressure settings from 1-10, then the low setting here is about a “4” and the high setting is a “7”. The power switch moves up and down smoothly, but the pressure switch is clunky and difficult to maneuver. For some reason, when set on the highest pressure setting it looks like the switch is stuck in the middle. It cannot go higher than that. This issue was also found on the previous model, the Cordless Plus, which this model replaces. This is just more evidence that this “update” is more like a cash grab. Unless you constantly switch the pressure settings or are sharing with someone, this will be a minor annoyance. At the bottom of the WP-440 is the charging socket. This is where the charger would plug into. The gold pins are coated with a layer of grease which is supposed to reduce the likelihood of it corroding. However, the gold pins do corrode over time, and many users have already complained that their unit stopped charging entirely. We found that scraping away the rust solved the issue. Located at the back of the unit is the water tank. 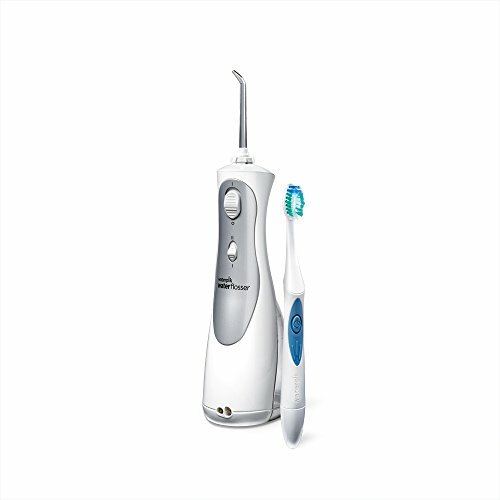 It has a 7oz capacity, which means this little feller can let you floss for 45 seconds before running out. Countertop flossers can hold 3-5 times more water than this, but the trade off is that you aren’t going to bring it with you on trips due to their large size. On the side of the reservoir are markings that indicate the measurements. This can be useful for those who administer medication since they can add it directly into the water tank instead of mixing it elsewhere. To fill the tank up, first open the hinged cap. 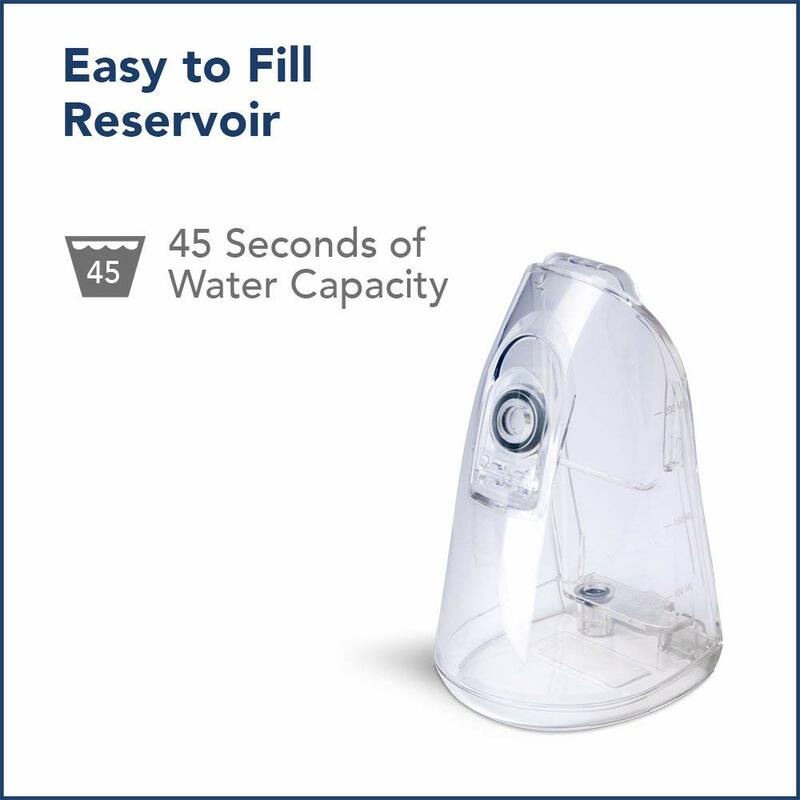 Once it is open, you can pour the water in through the round hole. You can detach the reservoir if you find it more convenient, however you have to cover the hole on the bottom (this is where water gets fed to the water flosser) or else it will leak out. Detaching the container allows you to clean it more easily as well. The reservoir can be cleaned with the dishwasher on the top rack so you can leave it in there for a cycle every once in a while. If there are water deposits, just clean it with a solution of vinegar mixed with warm water. Above the reservoir, located on the Cordless Professional, is an ergonomic rubber grip. Despite the Waterpik Cordless Plus being a big on the larger side for a portable flosser, this section makes holding it much more comfortable and easier to grip. Even if your hands are soapy or wet, the raised sections on the rubber provide extra grip. At the very top of the WP-440 is the flosser tip holder, and close to it is the eject button. Installing the tip is just a matter of aligning the base into the holder until it clicks in place. To remove it, press the grey release button and the tip will slide right out. The tip you selected can be rotated even after its been installed. Waterpik boasts that the tips can rotate 360 degrees, however this not completely true. Yes, it can turn completely in a circle, however there are about 8 positions it will remain at within that range of movement. The tip rotator allows you to turn the tip around without needing to reposition your grip on the water flosser. There are four tips included with the WP-440. Classic Jet Tip – Comes included with all Waterpik flossers. Recommended for general purpose cleaning. Orthondontic Tip – This flosser tip has tapered bristles on the end, allowing you to scrub braces or retainers while simultaneously water flossing. Plaque Seeker Tip – Similar to the orthodontic tip, this also has tufts near the hole where water shoots out. It is designed to clean dental restorations like bridges, implants, and crowns. The bristles and stream of water are an effective combo when removing plaque. The first thing to do before using any electronic device is to make sure it is fully charged. To charge the Cordless Professional, just connect the adapter to the socket of the WP-440 and plug it into an outlet. While it is charging, there doesn’t seem to be an indicator to signal that the unit is charging, or that it has reached full charge. There isn’t even any sort of indication when the battery is running low. The instruction manual does little to clear the confusion. It states that the battery requires 24 hours of charge time for a fully depleted battery to charge, and that letting the battery die reduces its lifespan. We decided to contact customer support to get a few things clarified, such as why some of our reviewers were having battery problems even though we charge it often. Their response was that we were likely overcharging the battery, which reduces its lifespan (letting it completely die also does this). That still does not answer our question of how often we should charge our batteries and for how long. With some testing of our own, we determined it takes approximately 14 uses at 45 seconds per session before the battery would completely die on us. With this in mind, you should charge your battery sometime before using it the fourteenth time, and not for more than 24 hours, as both situations would be detrimental to the battery. Like its predecessor the Cordless Plus, the Cordless Professional claims to be, well, cordless and portable so that you can take it with you wherever you go. 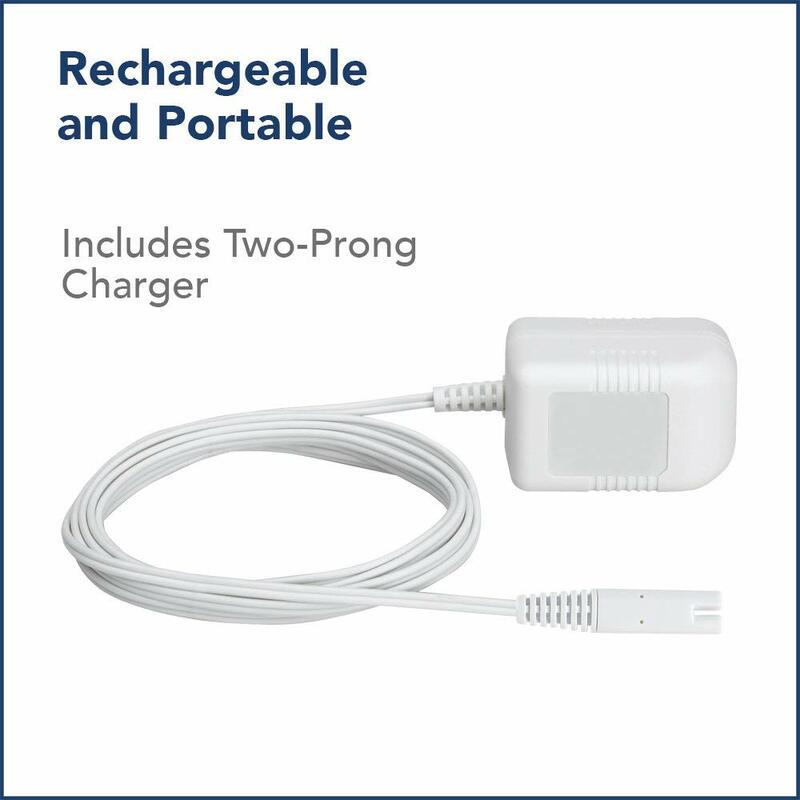 However, its portability is debatable, since the unit can only charge on 110V outlets. Anything higher than that will damage the battery. Unless you have a universal adapter, we recommend you check out the Waterpik Cordless Freedom, which runs on AA batteries and thus avoids this issue completely. If you are staying within North America, then this is not something you need to worry about. Now that we have our battery issue settled, it is time to test out its cleaning power. Those of you who are used to using a countertop Waterpik product may be surprised that this portable product is actually quite bulky as well. Countertop water flossers keep most of their weight in the main body, and the user flosses with a lightweight handle. However, the Cordless Professional is bottom heavy and thus hard to control since you are gripping it higher up where the grey rubber area is. This issue is common among cordless water flossers, since all components of the flosser are being carried at all times. However, with practice the clunky feeling will go away, however expect a slight adjustment period when getting started. Filling the water tank was a simple process. Expect water to trickle down the water flosser if you have a small sink, or you could detach the water tank to free up some space when filling it up. Once the water tank has been filled, slide the power switch on and get ready to hear the pump roar into action. It is quite noisy, so if you are flossing late at night, expect to potentially wake up everybody sleeping nearby. Countertop models are just as loud, but from the user’s perspective they are quieter since the pump is located at the main body farther away, and not the handle. In the case of a portable flosser, since the pump is also by the handle, you can hear the loud noise much closer to your face some people might not appreciate. In terms of cleaning power, we were quite satisfied with what it could do. However, those who have used countertop water flossers may not feel the same way. The Cordless Professional cannot match the lowest or highest pressure settings of countertop flossers, which means people whose preferences are on the extremes would not find it to their liking. For the vast majority of users, it should be more than adequate. Due to its somewhat bulky size, there can be a slight learning curve as you get used to the grip and maneuvering the tip to reach all areas of your mouth. You will end up refilling the water tank a lot as you learn how to properly use the flosser. Until you know exactly what you are doing, chances are you’ll run out of water before you are done fully cleaning your mouth. Once you become proficient with the Cordless Professional, one tank is all you’ll need to water floss both sets of teeth. If you are someone who likes to take their time, then be prepared to refill the tank numerous times per flossing session. Though the WP-440 is quite portable, it unfortunately does not come with a travel case. You will have to bring your own case or bags. This is not a major issue, but we still would have liked a case that can fit the flosser and all of its tips in one convenient location. Though the Cordless Professional is Waterpik’s latest rechargeable water flosser, no improvements have been made over its predecessor, the Cordless Plus. The Cordless Plus is a beloved product, so this is not necessarily a bad thing. However, it is disheartening to see Waterpik charge more money for what is essentially the same product they released many years ago. Next, there is the price to consider. For just a few dollars more, you could buy a feature-packed countertop water flosser. If you want to purchase a Cordless Professional (or any cordless flosser for that matter), then make sure you have the lifestyle conducive to making use of its benefits. For instance, if you floss at home all the time, then it may be better to invest in a countertop flosser. If you travel frequently, however, then investing in a portable flosser so that you can take good care of your teeth while travelling is a smart choice. And Waterpik’s Cordless Professional is a solid choice in that regard as well.